Anime Mp3 Music Sharing. Love Live Music. Genki Zenkai DAY! DAY! DAY! 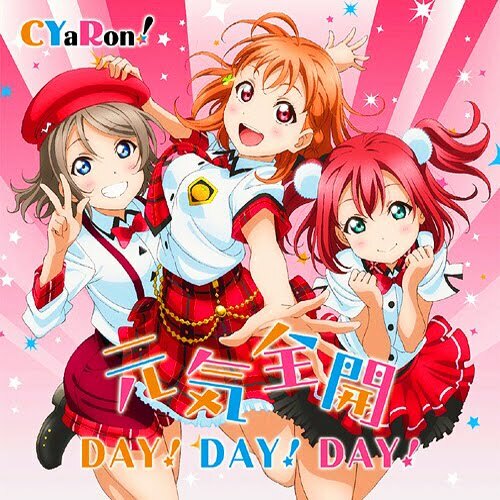 - CYaRon! - 1st Single - Love Live! Genki Zenkai DAY! DAY! DAY! Performed by Cyaron (Chika,You,Ruby) For report the broken link please commend. Love Live! Sunshine! CYaRon! - 1st Single Genki Zenkai DAY! DAY! DAY! Leave Credit Daloadmusic Please if you share it Please, no advertise link if you share it again. Thank you.